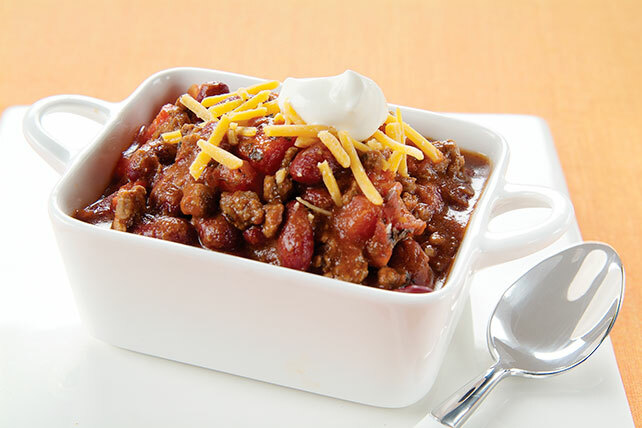 Learn what makes this the Best Chili Recipe. Is it that creamy dollop of sour cream? The fact it's low cal and low fat? Whatever. Best chili recipe ever. Add beans, tomatoes, salsa and chili powder; mix well. Bring to boil. Cover; simmer on medium-low heat 10 min., stirring occasionally. Serve topped with cheese and sour cream. Substitute 1 cup frozen BOCA Veggie Ground Crumbles for the browned ground beef. Sprinkle with chopped fresh cilantro or green onions before serving.